Mixed race Jessica Olsson is married to Dirk Nowitzki; the German NBA player. Though her father is originally from Sweeden, her mother is from Kenyan.Jessica currently works at the Dallas Art Gallery and she is also the associate director of the Goss-Michael Foundation. Jessica met Dirk in 2010 at a charity event organized for the Sports for Education and Economic Development (SEED) Project. Jessica captured his eyes and as part of the charity work he attended two of such events. Jessica at the time worked at a Dallas art gallery. They began dating and two years later they were engaged. They walked down the aisle on the 20th of July, 2012. They celebrated each other’s backgrounds and had wedding ceremonies in both Germany and Kenya. Dirk got to understand his wife’s heritage as he got to meet the family and discuss on a formal dowry. It was a new experience for the couple as Jessica grew up in Sweden. They had their honeymoon in the Caribbean and the relationship is getting along fine. Between them, they have 3 kids; 1 girl and 2 boys. They welcomed their first child; a girl named Malaika in July 2013. The next was Max who was born on the 24th of March, 2015 and finally, Morris, the youngest child was born on the 11th of November, 2016. Her husband Dirk Nowitzki is the famous German professional basketball player who plays for the Dallas Mavericks. He was born on the 19th of June, 1978 in Würzburg, Germany. Dirk is one of the only seven players to ever play at least 20 seasons in the NBA. Dirk has been with the club ever since he was traded by the Milwaukee Bucks to the Mavericks in 1998. He is considered to be one of the greatest power forwards of all time. Just like you would expect from a basketball player, Dirk is currently 7 ft tall. Initially, he played handball but grew tired of being called a freak as a child due to his obvious height. He later switched to basketball and the rest they say is history. Today, he is the Mavericks all-time lead scorer, 12-time All-NBA Team member, NBA Champion 2011, 13-time All-Star, 2007 NBA MVP, 2011 NBA finals MVP and two-time FIBA Europe player of the year. He founded the Dirk Nowitzki Foundation, a charity which aims at fighting poverty in Africa. Dirk is from a family of athletes and sports personalities; his father Jörg-Werner was a handball player who represented Germany at the highest level and his mother Helga Nowitzki (nee Bredenbröcker) was a professional basketball player. His older sister Silke Nowitzki was a local champion in track and field, later she became a basketball player and she currently works for the NBA in International TV. His older sister Silke has always said how proud she is of his unmoved and spoiled character despite being a top NBA player. His net worth is $120 million with an annual earning in the range of $22.7 million. Jessica Olsson was born to a Swedish father and a Kenyan mother. She has male siblings who are twins; Marcus and Martin, they are also well-known soccer players. Her brothers Marcus and Martin are twins and are both professional soccer players. They both play left back positions for their respective clubs. They were born on the 17th of May 1988 in Gävle in Sweden. 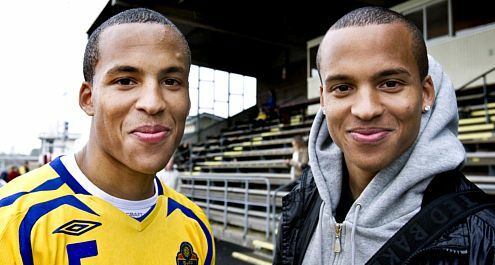 Marcus Jonas Munuhe Olsson is a Swedish professional footballer who plays for Derby County as a midfielder and a sometimes as a left back. He wears jersey number 29, his twin brother Martin Tony Waikwa Olsson is also a Swedish professional footballer who plays for Swansea City and he plays left back for his team, he wears the jersey number 16 for his club. Their brother-in-law is NBA star Dirk Nowitzki who is husband of their older sister Jessica Olsson. Jessica is the first of three to her parents, she has brothers (twins) as siblings and though they are Swedish by nationality they don’t shy away from their mother’s Kenyan origin and nationality. She is perfectly matched to her husband Dirk, she is of perfect height but her husband is seven feet tall. Looking at the couple it isn’t really obvious because she is also tall.